Russia's United Aircraft Corporation (UAC) has rolled out the first Il-78M-90A air tanker, based on the Il-76M-90A upgraded version of the strategic airlifter. The event took place on November 29 at the Aviastar-SP plant in Ulyanovsk. Aviastar has already delivered three Il-76M-90As airlifters to the Russian Air and Space Force (VKS) out of 39 on order and ahead of the expected official induction of the type in 2019. The Il-78M-90A effort is led by the Ilyushin design house in Moscow. This version has not yet won formal clearance for quantity production. The first aircraft—manufacturer’s serial number 0201—was completed under a dedicated R&D contract for a “Future Air Tanker.” It is expected to make its maiden flight early next year. The Il-78M-90A is meant to supplement and later replace 15 Il-78 and Il-78M air tankers that used the basic Il-76MD airlifter platform. UAC hopes to win a VKS order for 30 new air tankers, but is meanwhile doing lifetime extension and upgrade work on the older Il-76s and Il-78s that remain in service. Anticipating a production contract award, Aviastar-SP is already assembling at least two more Il-78M-90As. Alexei Rogozin, who acts as the UAC vice president responsible for airlifters and also as CEO and general manager of Ilyushin, said the new air tanker features new engines; a modified wing; a strengthened bulkhead in the rear fuselage; and new flight control systems. From the baseline Il-76M-90A airlifter, the Il-78M-90A differs in having two additional tanks for fifty metric tons of fuel located inside the cargo compartment. This increases the total fuel capacity to 126 metric tons (277,200 pounds), which is 60 percent of the aircraft’s mtow (210 metric tons/493,000 pounds). Refueling is conducted via fuel pods: one under each wing and a third attached to the port side of the rear fuselage. Fighter aircraft can take fuel from all three refueling points, whereas bombers can use only the centerline one. On the ground, the air tanker can feed four aircraft at a time. 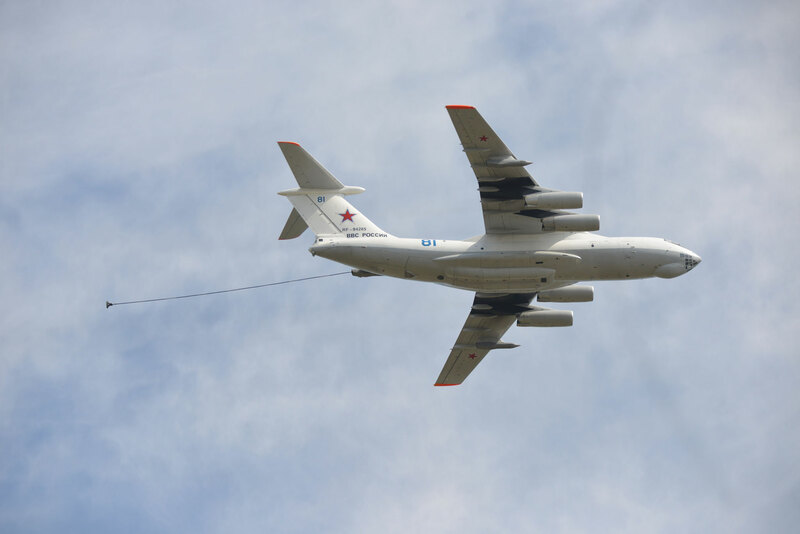 The Il-78M-90A design retains the large cargo ramp in the rear fuselage and equipment for airdropping; and can be converted into a standard airlifter by removing the additional fuel tanks and onboard equipment for refueling. If required, firefighting equipment can be installed. In addition to supplying Il-78M-90As to the Russian air force, UAC also hopes to win foreign orders. India has declared its intent to acquire additional Russian air tankers, having reconsidered its earlier selection of the Airbus A330 MRTT. The Indian air force currently operates six Il-78Ms that were the last to come from the old Il-76/78 production line in Tashkent, Uzbekistan. Pakistan and China have opted for Il-78MP conversions of standard Il-76 airlifters done in the Ukraine. Separately, another new design based on the upgraded Il-76M-90A airlifter has flown. The A-100 Premier AWACS aircraft flew for the first time on November 18. As previously reported, the A-100 is a project of the Beriev company, which has its own plant in Taganrog (formerly TAVIA) producing special mission aircraft using “green” airframes assembled in Ulyanovsk. The key feature of the A-100 is a new active electronically scanned array (AESA) radar.